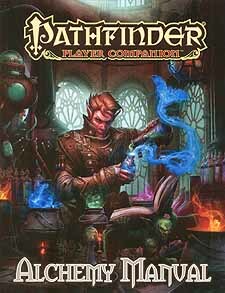 Harness the powers of alchemy with Pathfinder Player Companion: Alchemy Manual. Along with nearly 100 never-before-seen alchemical items, this volume features a brand-new rules subsystem for creating potent alchemical items on the fly using a variety of alchemical reagents and alchemical recipes. Whether you're brewing the magical dwarven ales of the Five Kings Mountains or honing the deadly secrets of the Daggermark Poisoners' Guild, you'll discover all the tools you need inside the Alchemy Manual. New rules for crafting a wide variety of alchemical items in mere seconds using specialized reagents and alchemical processes. Over 85 new alchemical tools, weapons, remedies, poisons, and drugs. Entangle your foes with Kyonin alchemical arrows, bolster your allies' defences with Belkzen bloodgorge or Pei Zin incense, and disintegrate the armour of entire armies with Thuvian wish alchemy. Details on some of Golarion's most famous alchemical practitioners and their methods, including the firework makers of Varisia, the derro magisters of the Darklands, and the homunculus crafters of Ustalav. New ways to craft and use alchemical items ranging from the practical to the bizarre, such as a method to use herbalism in place of alchemy and rules for crafting living oozes from raw ingredients. A new class archetype, over a dozen new pieces of adventuring gear, new magic battles to contain your alchemical creations, and much more.